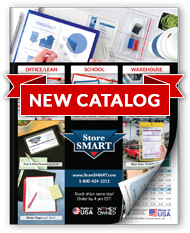 StoreSMART's Multi-Pocket Plastic Folders are an effortless, versatile way to prepare reports, training packets, and product brochures. The two crystal clear 8 ½" x 11" overlays on the front and back covers can be used to house title pages or presentation outlines, while the interior 4 ½" pockets and sheet protectors give you room to showcase every piece of vital information. Every part of our Multi-Pocket Plastic Folders is constructed of 100% super polypropylene archival material to help protect your valuable documents, and unlike paper folders and organizers, they won't tear, wilt, dog-ear, or discolor. A professional business or medical environment demands professional materials. Don't settle for anything less—choose a paperwork organizer that can stand up to the toughest treatment, and come out looking as fresh as your ideas. Stain-resistant—ink doesn't transfer to the plastic. Available in a large array of colors. Three-hole punched to work with most binders. Dimensions when closed: 9 7⁄16" x 11 ¾". Dimensions when open: 18 7⁄8" x 11 ¾". Outside pocket dimensions: 8 ½" x 11", crystal clear. Inside pocket dimensions: 4 ½" crystal clear pockets on both interior covers. Interior folder capacity: Holds 40 sheets per side. Features four crystal clear sheet protectors. Open the top. Made to order. 1-2 week delivery time. Use our Multi-Pocket Plastic Folders to create personnel or patient files—slide a piece of paper with the recipient's name into the clear front cover, and place relevant information inside the organizer. Looking for a way to create quick marketing materials, or need to present clients with a bundle of catalogs, order forms, and other paperwork? These organizers are an attractive solution! Color-code your work projects, or use our organizers to route paperwork throughout your facility. This product is also ideal for students. Keep subject files organized, prepare beautiful reports, and present orientation materials with ease. For Multi-Pocket Plastic Folders with custom printing, click here. Your organization's logo, motto, or copy can be printed on the cover. For artwork specifications, click here.